This is the second post in a series about our four-day trip in the Victorian countryside. The trip takes us from Melbourne to Ballarat, from Ballarat to the Grampians then on to Horsham. We woke up fairly early, since my brother-in-law has to be at work by 8:30am. Thanks to Google Maps, the accomodation we picked was only 2 minutes away from the venue where he was set to conduct a seminar. This gave us time to have breakfast and spend some time in the playground, while waiting for the park administration office to open so we can borrow a flat iron. 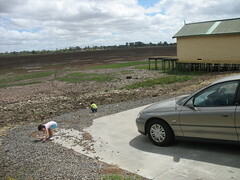 After driving brother-in-law to work, we headed back to Cabin E14 at Lake Wendouree Tourist Park to plan our day. While the kids watch Angelina Ballerina, my sister and I studied the Ballarat map, familiarizing ourselves with the area. High in our priority was to find a supermarket for additional provision, as well as the Rivers store. The kids played with the contents of their luggage before leaving Melbourne, and it left my niece without any shirt to wear. Armed with our map, we left the little house and set out for Ballarat’s city centre. Ballarat was an old gold mining town; its prosperous past evident in the sprawling estates fronting Lake Wendouree and the magnificent buildings, carefully preserved lining up Ballarat’s main roads. 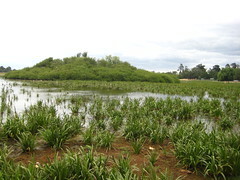 Ballaraat, as it is also known, is derived from an Aboriginal words “balla” and “arat” that translated to camping or resting place. True enough, Ballarat did become a place where everybody, from other parts of Australia and other parts of the world, came to rest — and pan for gold — in the 1850’s, when gold was discovered in Ballarat’s soil. Soon, there were 20,000 diggers in the shafts and goldfields, all searching for the metal that would bring them prosperity. And prosper they did. Approximately 200,000 ounces of gold were found in Ballarat’s goldfields, including the Welcome Stranger, one of the world’s biggest gold nugget ever found. Weighing 2316 troy ounces or 72.04 kg and measuring measuring 61 cm by 31 cm (24in x 12in), the Welcome Stranger was discovered by John Deason and Richard Oates just a mere 5 centimeters (2 inches) under the ground. 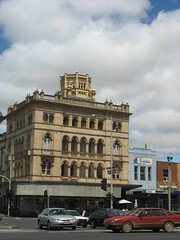 Deason and Oates took the nugget to the London Chartered Bank (Dunolly), where they were paid a whopping £19,068. Of course, as history would tell us, good things almost always come to an end. With the rise of diggers coming in from all over the world, the government imposed regulations and licences for all the miners. This led to the Eureka stockade, the miner’s rebellion againts the government. The gold rush and the Eureka rebellion is an important part of Ballarat’s history, and they preserved it in the best museum I have ever been to: Sovereign Hill. Unlike other stuffy museums, where all the pieces are behind glass or cordoned off, far from the visitor’s dirty hands, Sovereign Hill encourages you to be a part of the museum, and experience history. 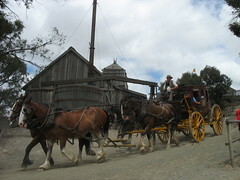 An interactive museum, once you have entered Sovereign Hill, you are quickly transported to the 1850’s. The 25-hectare museum is made to depict life in the 1850’s, when gold was found in Ballarat. Here you will see the houses where the miners and their families live, the equipment they use for mining, and the kind of life they had. You are encouraged to pan for fold in the small stream, go down a mine shaft with the Cornish brothers who discovered the Welcme Nugget, join a carriage ride around the town, practice your calligraphy at the one-room school, or have your picture taken wearing period clothing. To complete the experience, costumed volunteers are scattered around various attractions, ready to answer your questions about Ballarat’s history. Loaded with 2 big shopping bags filled with shoes (don’t ask), we head back to the cabin to unload our loot and prepare some snacks for a picnic. After picking up brother-in-law, we head to the Botanical Garden. The Botanical Garden is right on the bank of Lake Wendouree, which (according to the Ballarat website), “covers 40 hectares divided into three distinct zones – the central Botanical Gardens which preserves the ‘gardenesque’ style of the Victorian pleasure garden, and open parkland buffers on either side are known as the North and South Gardens.” The best part of the garden for me though, is the playground. 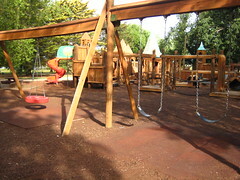 Unlike most playground where the activities are limited to small children, this playground is for kids from age 2 to 62. After an hour in the playground and a round of ‘ccinos (mochaccino for me and my sister, cappucino for brother-in-law, babyccinos for the kids), we head back to our “little house” for a much needed rest — we have a long day of driving tomorrow. Only three days left! Share with us your most memorable travel experience and win a Lonely Planet travel journal. Click here to find out how to join. This was a great write-up. Somehow we missed this area when we drove from Melbourne to Adelaide. I think we must have looped further south.